Tabanan, Bali. At a time when life is more fast-paced than ever, where everything demands to be attended at once, it is refreshing at times to just switch off and go inward to listen to the one that needs attention the most — ourselves. Located in Tabanan, about a one hour drive from Denpasar, the Bali Silent Retreat offers the perfect place to do so. 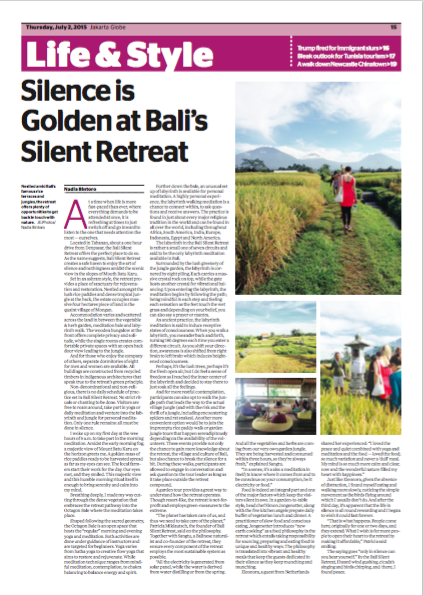 As the name suggests, Bali Silent Retreat creates a safe haven to enjoy the art of silence and nothingness amidst the scenic view in the slopes of Mouth Batu Karu. Set in an ashram style, the retreat provides a place of sanctuary for rejuvenation and restoration. Nestled amongst the lush rice paddies and dense tropical jungle at the back, the estate occupies massive four hectares piece of land in the quaint village of Mongan. Accommodation varies and scattered across the land in between the vegetable & herb garden, meditation bale and labyrinth walk. The wooden bungalow at the front offers complete privacy and solitude, while the single rooms creates comfortable private spaces with an open back door view leading to the jungle. And for those who enjoy the company of others, separate dormitories of eight for men and women are available. All buildings are constructed from recycled timbers in indigenous architectures that speak true to the retreat’s green principle. Non-denominational and non-religious, there is no daily schedule of practice set in Bali Silent Retreat. No strict rituals or chanting to be done. Visitors are free to roam around, take part in yoga or daily meditation and venture into the labyrinth and jungle for personal meditation. Only one rule remains: all must be done in silence. I woke up on my first day at the wee hours of 6 a.m. to take part in the morning meditation. Amidst the early morning fog, a majestic view of Mount Batu Karu on the horizon greets me. A golden mass of rice paddies ready to be harvested spread as far as my eyes can see. The local farmers start their work for the day. Our eyes met, and they smiled. This majestic view and this humble morning ritual itself is enough to bring serenity and calm into my mind. Breathing deeply, I made my way cutting through the dense vegetation that embraces the retreat pathway into the Octagon Bale where the meditation takes place. Shaped following the sacred geometry, the Octagon Bale is an open space that hosts the “regular” morning and evening yoga and meditation. Both activities are done under guidance of instructors and are targeted for beginners. Yoga varies from hatha yoga to creative flow yoga that aims to restore and rejuvenate. While meditation technique ranges from mindful meditation, contemplation, to chakra balancing to balance energy and spirit. Further down the bale, an unusual set up of labyrinth is available for personal meditation. A highly personal experience, the labyrinth walking mediation is a chance to connect within, to ask questions and receive answers. The practice is found in just about every major religious tradition in the world and can be found in all over the world, including throughout Africa, South America, India, Europe, Indonesia, Egypt and North America. The labyrinth in the Bali Silent Retreat is rather a small one of seven circuits and said to be the only labyrinth meditation available in Bali. Surrounded by the lush greenery of the jungle garden, the labyrinth is cornered by eight piling, Each carries a massive crystal rock on top, while the gate hosts another crystal for vibrational balancing. Upon entering the labyrinth, the meditation begins by following the path; being mindful in each step and feeling each sensation as the feet touch the wet grass and depending on your belief, you can also say a prayer or mantra. An ancient practice, the labyrinth meditation is said to induce receptive states of consciousness. When you walk a labyrinth, you meander back and forth, turning 180 degrees each time you enter a different circuit. As you shift your direction, awareness is also shifted from right brain to left brain which induces heightened consciousness. Perhaps, it’s the lush trees, perhaps it’s the fresh open air, but I do feel a sense of freedom as I reached the inner center of the labyrinth and decided to stay there to just soak all the feelings. And for more restful contemplation, participants can also opt to walk the jungle path that leads the way to the actual village jungle (and with the risk and the thrill of a jungle, including encountering spiders and rat snakes). Another more convenient option would be to join the impromptu rice paddy walk or garden jungle tours that happen serendipitously depending on the availability of the volunteers. These events provide not only the chance to gain more knowledge about the retreat, the village and culture of Bali, but also chance to break the silence for a bit. During these walks, participants are allowed to engage in conversation and ask question to the tour leader as long as it take place outside the retreat compound. A garden tour provides a great way to understand how the retreat operates. Though resort-like, the retreat is not-for-profit and employs green-measures to the extreme. “The planet has taken care of us, and thus we need to take care of the planet,” Patricia Miklautsch, the founder of Bali Silent Retreat, said on the philosophy. Together with Sangtu, a Balinese naturalist and co-founder of the retreat, they ensure every component of the retreat employs the most sustainable system as possible. Food is indeed an integral part and one of the major factors which keep the visitors silent in awe. In a garden-to-table style, head chef Simon Jongenotter, along with the five kitchen angels prepare daily buffet of vegetarian lunch and dinner. A practitioner of slow food and conscious eating, Jongenotter introduces “new earth cooking” as a food philosophy in the retreat which entails taking responsibility for sourcing, preparing and eating food in unique and healthy ways. The philosophy is translated into vibrant and healthy meals that keep the guests dedicated in their silence as they keep munching and munching. Just like Eleonora, given the absence of distraction, I found myself eating and walking more slowly, noticing the simple movement as the birds flying around which I usually don’t do. And after the third day, it’s apparent that the life in silence is all round rewarding and I began to wish it could last forever. “That is what happens. People come here, originally for one or two days, and they extend. What I wish is for more people to open their heart to the retreat by making it affordable,” Patricia said smiling. The saying goes “only in silence can you hear yourself.” In the Bali Silent Retreat, I heard wind gushing, cicada’s singing and birds chirping, and there, I found peace.